Tertiary structure plays a role in how the hormone regulates receptor activation. The hormones in this family are long chain four a-helix bundle proteins [4,17]. A notable feature of their tertiary structure is that it contains no symmetry that might support equivalent binding environments for the receptors. How the two receptors bind to the asymmetric hormone was first revealed from the crystal structure of human growth hormone bound to the extracellular domain (ECD) of its receptor (hGH-R) . The structure showed that the two ECDs binding to site 2 and site 2, respectively, use essentially the same set of residues to bind to two sites on opposite faces of the hormone  (Fig. 1). An identical model is seen in a prolactin hormone-receptor complex . This binding is characterized by extraordinary local and global plasticity at the binding surfaces. The two binding sites have distinctly different topographies and electrostatic character, leading to different affinities for the receptor ECDs (Fig. 2). Figure 1 Mechanism of hormone-induced receptor homodimerization. The GH/PRL receptors are three-domain single-pass receptors containing an extracellular domain (ECD), a transmembrane section of about 25 amino acids, and a cytoplasmic domain that forms the binding site for the tyrosine kinase activities. The ECD consists of two fibronectin type III domains (FNIII) connected by a short linker. The hormones are four-helix bundle proteins. The initiation step involves the hormone binding event to the ECD (ECD1). The segments of the molecules that are involved in the contact (site 1) are colored red (hormone) and yellow (ECD1). They form a stable 1:1 intermediate that then recruits a second receptor in the regulation step through two sets of contacts (site 2)—one to the hormone and the other through forming receptor contacts (ECD1-ECD2). This step forms the stable homodimer, which organizes the cytoplasmic components to initiate binding and phosphorylation. 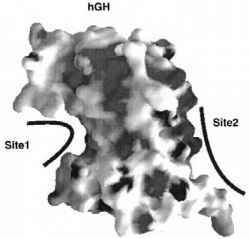 Figure 2 Molecular surface of hGH showing the different topographies of the site 1 and site 2 binding sites. In addition, the two sites possess quite different electrostatic properties (red, negative charge; blue, positive charge) (image rendered between ±10 kT). of ECD1. The binding of ECD2 is the programmed regulatory step for triggering biological action, and it involves a set of highly tuned interactions among binding interfaces in two spatially distinct binding sites. The energetic relationships between the ECD1-ECD2 contacts and the hor-mone-ECD2 site 2 interactions are known to be important. However, quantitative data are few in regard to which residues are the main contributors, whether they contribute in an additive or cooperative fashion, and how the binding energy is distributed in the interfaces.